Just arrived in Budapest, Hungary feeling groggy. The airport is much smaller than expected. It’s mid-afternoon, Hungary-time…I’ve eaten breakfast twice…or, was it lunch that I ate twice and breakfast and dinner only once? Even my watch, with multiple time functions, is confused. Our Zona Cab driver, a friendly native Hungarian, promptly whisks us from the airport to Erzsebet Korut. He is happy for us. He wants us to love Budapest. He’s proud of the people and cultural heritage. He speaks excellent English. Thank goodness. I’ve forgotten how to speak anything in Hungarian. I am jet-lagged. As the winter sun began to set, the lights appeared all around us. 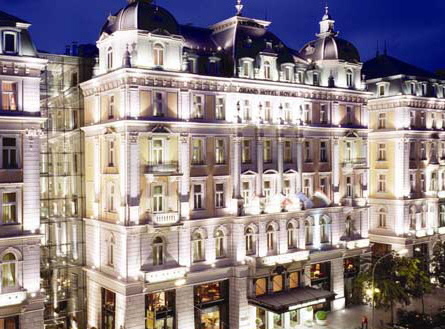 We gasped at the Corinthia “Grand” Hotel, a beautifully restored palace, glowing on this winter day in all its splendor. “R” is enthusiastic. He wants to take my picture, although we haven’t checked-in yet. “Limburger!”, he says while he takes a multitude of photos of me. “R” shows them to me, and they appear a bit jet-lagged blurry. 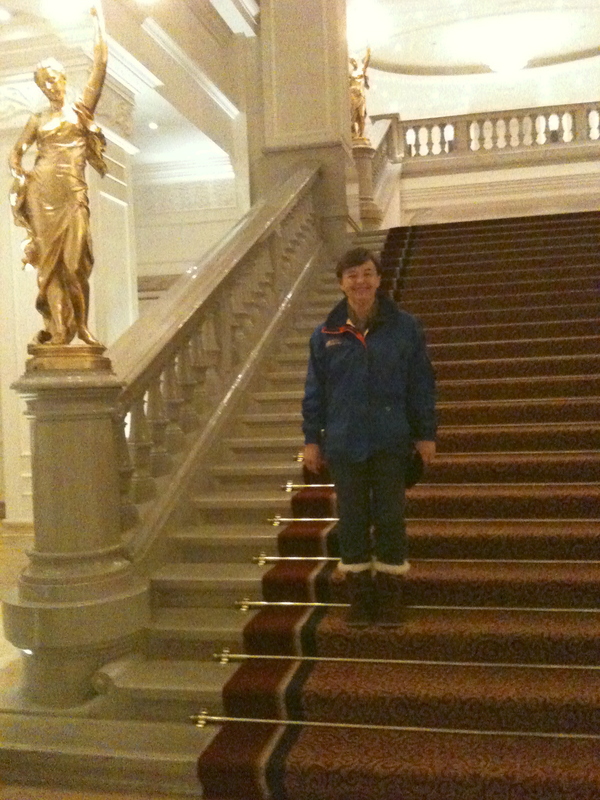 Our jet-lag begins to wear-off as we walk out onto Erzsebet Korut. It is cold outside. We take it all in…the Austro-Hungarian architecture, the stoic remains from the communist occupation, and the city dwellers walking home from work. I take note of a cluster of locals carrying bags of groceries home. I quietly think, oh joy! I know there’s a grocery store nearby…Yes, my Susitna Cafe’ friends, a grocery store. Can you believe it? Who in the world travels all the way across the Atlantic from Houston, Texas to Budapest, Hungary to spend time in a grocery store? We do. Why? Well, you would be amazed at what one can learn from the experience! 1) the locals eat fresh foods and shop daily as typical Europeans do–this is determined by strolling around the entire store first in order to get an overall broad assessment of the situation–are we having fun yet? 3) there is paprika everywhere–we’re not talking about paprika in small jars. We’re talking about paprika in bags and tubes. If paprika is not packaged in a bag or tube, it is commonly found as an ingredient in food items. At this point of my grocery store cultural assessment, my thoughts race as I consider all the recipes I could test and/or develop from this wonderful inspiration. In the meantime, “R” is beginning to look tired and Hungary hungry. I encourage him to be patient because I think I’ve found IT. IT is that one source of cooking inspiration that I simply must learn about during our trip. In this case, on our first day, IT must be paprika. Paprika is Hungarian. Hungary hungarians eat paprika. We are in Hungary, so we must eat paprika. We must learn about paprika too. My thoughts continue to race…well, there are so many kinds of paprika to consider… special quality, delicate, excuisite delicate, pungent excuisite delicate, noble sweet, half sweet, rose AND hot paprika. What is a girl to do? I convinced myself to hold that thought until I could figure it out later. After all, what is a girl to do? So, we walk out of Spar and head towards Andrassy Ut. What a sight as we ride the escalator to the second floor–the ceiling is gilded. Isn’t it marvelous? Our smiling waitress then begins speaking German. At this point, there is hope…I speak some German, and after doing so, she understands me! We are now “connected”. We enthusiastically order a hot tea, a latte and some sandwiches. 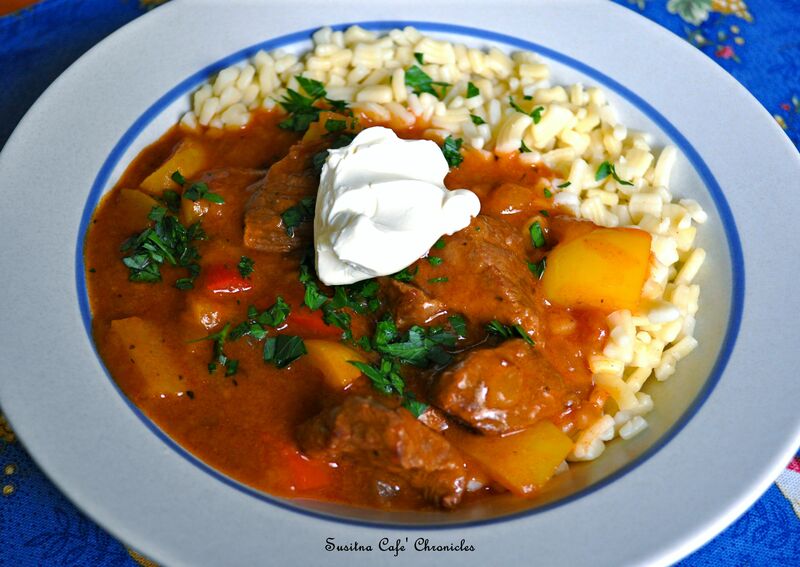 Lecso is a popular Hungarian national dish. Every Hungarian family has their own version. The Susitna Cafe’ version includes an assortment of colorful organic vegetables combined with sausage and, of course, paprika. 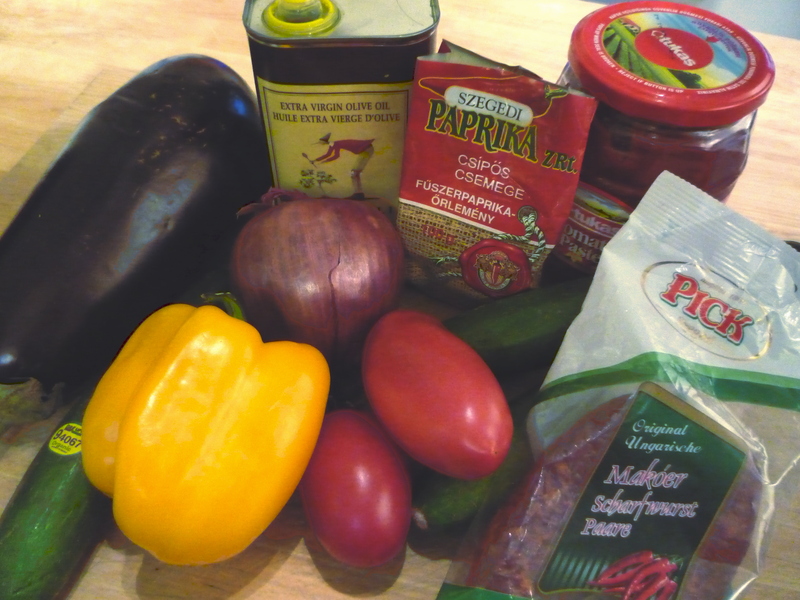 It is a wonderful winter stew inspired by Day 1 in Hungary, our art and food experience. Would you like to share the experience with me at the Susitna Cafe’? 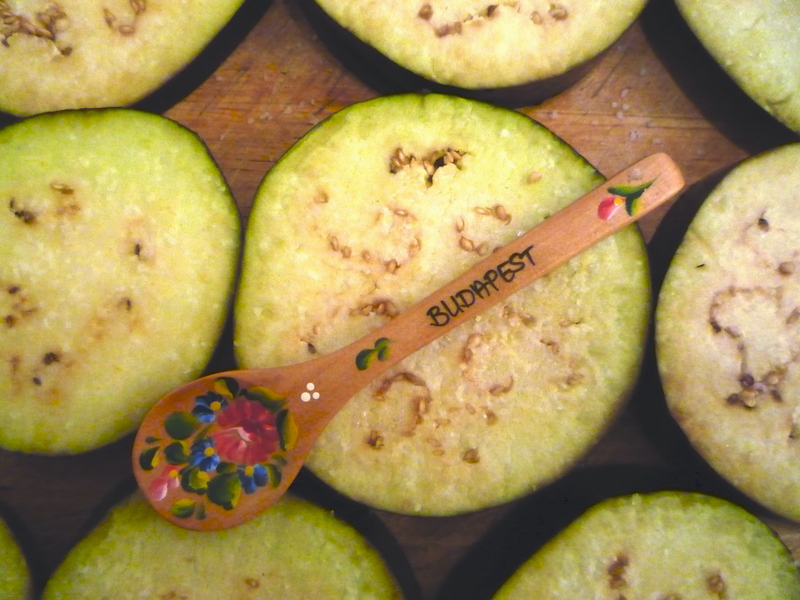 Begin by slicing the eggplant into 1 inch slices. Salt the tops and bottoms and leave for 10 minutes. The salt will extract any bitterness from the eggplant. Heat the oil in a dutch oven at medium-high heat. Meanwhile, clean and chop the red onion. Next, rinse the salt from the eggplant slices, pat them dry, and chop them. Throw the onion and eggplant into the heated dutch oven. Saute and stir. While the onion and eggplant cook, clean and chop the remaining vegetables. 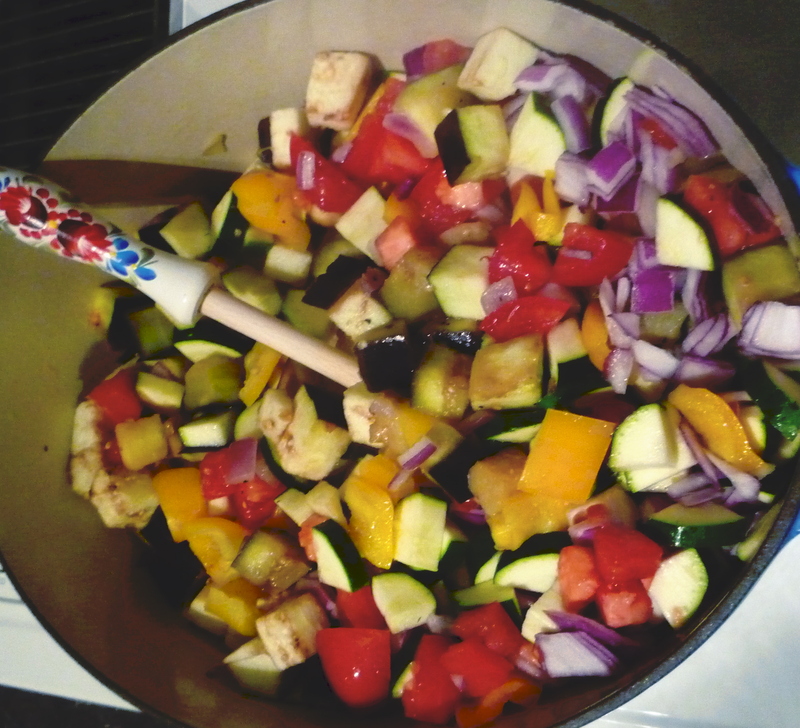 After the eggplant and onion are cooked soft, add the remaining chopped vegetables. Saute and stir. The vegetables may begin to stick to the pan, so you may add about 1/4 cup of water, as needed. Now add the tomato paste and paprika. Cook for about 10 minutes on medium heat, stirring occasionally. The Lecso should have the consistency of a chunky tomato sauce. Add the chopped sausage to the mix and continue cooking for 30 minutes. Add salt and pepper to taste. Less salt is required if sausage is used in the recipe. Now, turn-off the heat and allow the Lecso to come to room temperature. Although you may skip this step and dig-in, a little patience will reveal a richer and full-flavored Lecso. The cooling period allows the Lecso flavors to meld. Once the Lecso is cool, then reheat and serve. Serve with a dollop of light sour cream on top, some crusty bread, and a tossed green salad. 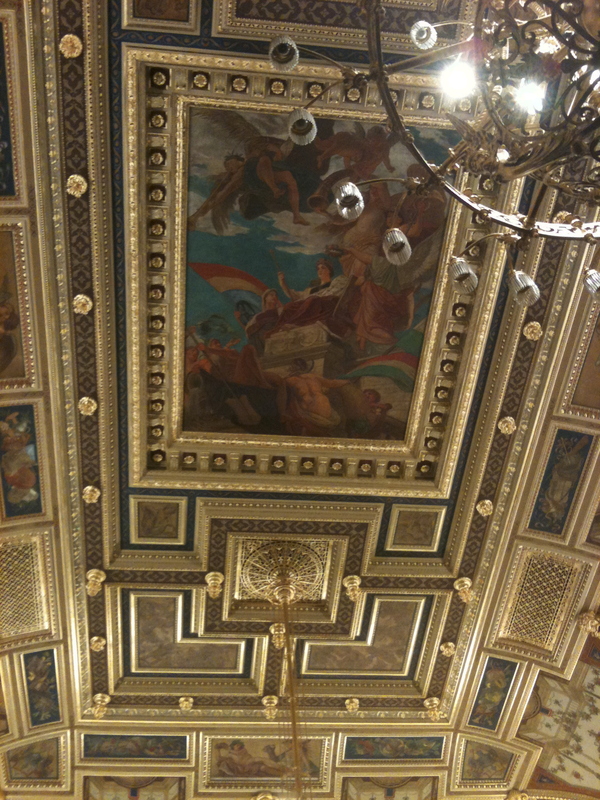 Traveler’s Notes: Since writing this post, I’ve discovered that the Alexandra Bookstore Cafe’ frescoes were painted by a 19th century Hungarian painter, Karoly Lotz.